Back in January, Detroit PAL hosted a local event at Boysville. This event was sponsored by the Jr. NBA Skills Challenge presented by Verizon. The Jr. NBA is the official youth basketball partner of the NBA. This is a free program for existing youth basketball leagues and organizations. The Jr. NBA is designed to help encourage and support youth basketball participation and to improve the basketball experience for all youth ages 6-14. The event that Detroit PAL helped put on January 13th, 2018 was a Skills Challenge presented by the Jr. NBA. 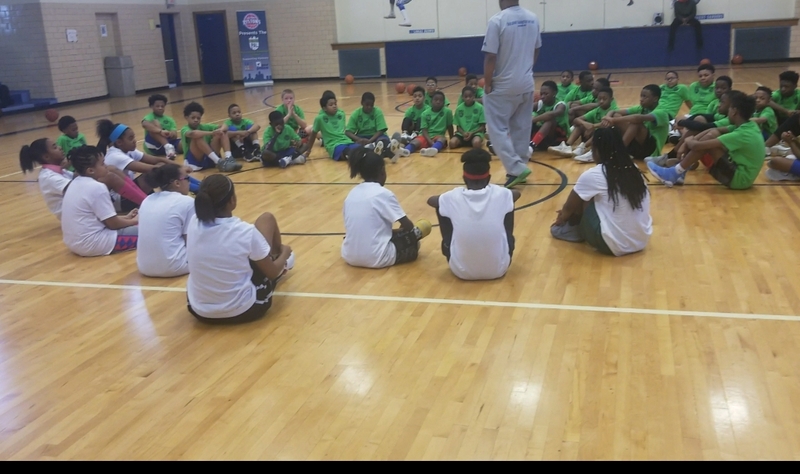 This event, held at Boysville, was open to the public and about 50 participants (girls and boys) came out and competed in a 60 second dribbling and shooting challenge. There was a boys and girls competition, which were divided into two age groups; the 11 and under and 13 and under groups. The top three finishers in each age and gender group got the opportunity to advance to the Regional Competition held in Chicago Illinois. The first place finisher in each age and gender group of the Regional Competition will receive a Regional Competition Award and advance to the National Finals. The National Finals will take place from June 19th-June 22nd in New York City before the 2018 NBA Draft presented by State Farm. These young people will have an experience that they will never forget and neither will the parents. Lerrol Franklin, who is the father of Elaysia Frankin, said he was excited when he found out that his daughter will be going to the Regional Competition. “I felt great about her accomplishment and this is a wonderful opportunity for her to experience somewhere outside of Detroit,” said Franklin. Elaysia has been involved in basketball for three years and she found out about the Jr. NBA Skills Competition through her father who is a police officer with Detroit PAL. Enomwoyi Franklin, the mother of Elaysia, said that she was ecstatic on Elaysia’s accomplishment. “This is a tremendous blessing for her and I can’t be any more proud of her,” said her mother. Her mother said that Elaysia’s coaches call her baby Candace Parker. Elaysia always studies the game on her own and watches videos of professional basketball players. “I’m very excited for regionals and I expect to go to nationals,” said Elaysia. Kevin Lewis, the father of Isaiah Lewis, said that this will be an experience his son will always remember. “I’m looking forward to Chicago and I know Isaiah is too,” said Kevin. Isaiah is a good point guard and always tries to get his teammates involved. “He possess really good skills for an eleven year old and I’m very proud of him,” said his father. There were some parents who were actually shocked that their kids made it to regionals, but they were still very proud of them at the same time. Shannon Sullivan, the mother of Jameer and JaeBri’an, was surprised that her youngest daughter (JaeBri’an) finished in the top three. “JaeBri’an is a late bloomer so to find out that she finished in the top three was very shocking to us,” said mom. “But she has come along quite well and I’m excited for the things she’s doing.” Now older brother Jameer has been involved in basketball a little bit longer than his sister. “Jameer is a leader and can pretty much play each position on the court,” said mom. Unfortunately not all of the participants can travel to Chicago due to specific reasons. But for the ones who will be traveling to Chicago we at Detroit PAL want to wish them the best of luck and safe travels and we are hoping that there will be some kids that have the opportunity to go to New York City for Nationals.